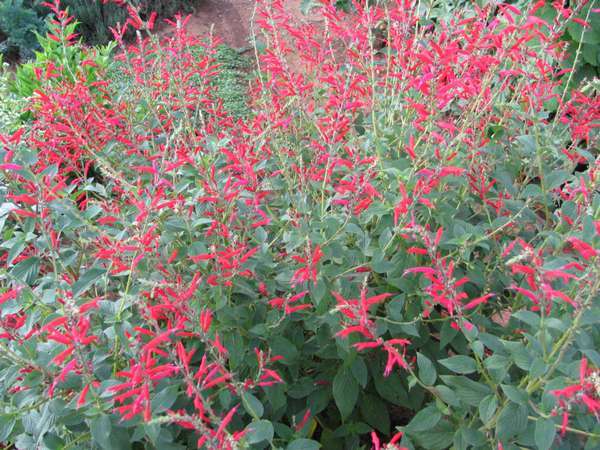 PINEAPPLE SAGE (Salvia elegans) is, as its name indicates, a truly elegant addition to your decorative and herbal bed. Growing quite large as a graceful rounded shrub up to 5 feet when it is able to overwinter, which it can in warmer climes, or pot up to bring in for the winter. 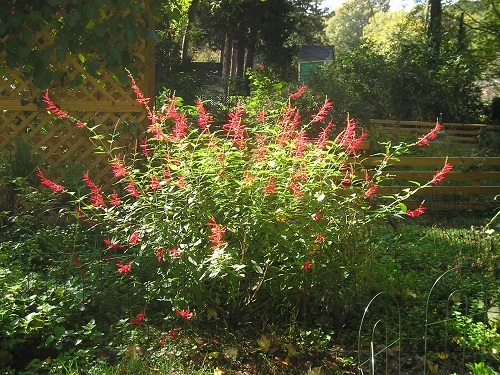 It produces long fiery red florescence in fall that make a spectacular show with other fall flowers and attract (and feed) hummingbirds and butterflies making their migration. But the most wonderful thing about this salvia is its fragrance -- a pronounced and true pineapple scent when bruised. The leaves and flowers make a delightful tea (hot or cold), or muddled in cocktails. 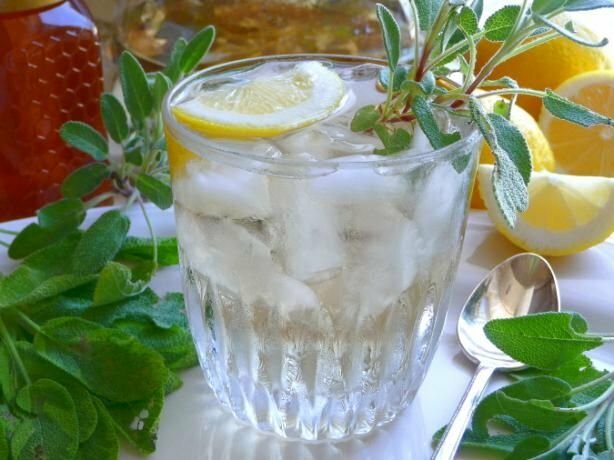 The flavor is very fruity and pleasant, so it is a wonderful addition to desserts and entrees such as curry or as a garnish for ham or fruit salads or lemonade,or mixed with soft cheeses for a dynamite spread. Some even make a jelly using it. Tender perennial (mulch or pot up to over winter). And they make a dramatic addition to the flower vase, as you can see from the early November cuttings of dahlia, zinnias and pineapple sage below. Perennial Zones 8-11. Grow as annual otherwise. One 4" Pot. 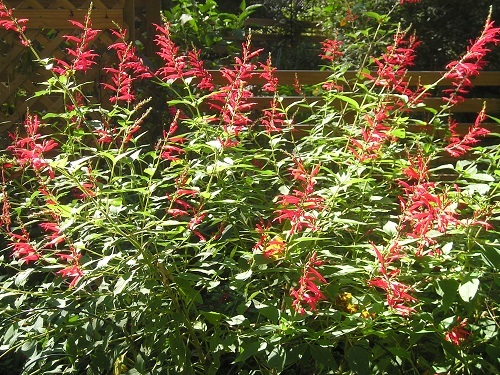 MEDICINAL PROPERTIES: The name "Salvia" comes from the Latin "salvere," meaning "to heal." The Romans considered sage to be sacred and even had special harvesting ceremonies. All sages have traditionally been considered antispasmodic, antiseptic, astringent, diaphoretic, expectorant, nervine and tonic. Used as a folk remedy against colds, diarrhea, enteritis, venereal disease, excessive perspiration, snake bites, sore throats, toothaches and cancer. Recent clinical studies have shown it is useful lowering blood sugar in diabetics. Strongly flavored, so if brewing as a tea, try combining with dried fruits such as apple, or fragrant raspberry leaves. Combined with rosemary, and boiled to make a "tea", it can be used to restore gray hair to its natural color. Let the combo cool and steep in your refrigerator. After shampooing, use a cotton ball to apply to gray (or rinse if you are gray all over) and let dry. 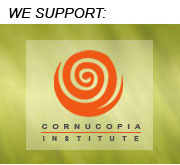 Use weekly. Restoration will take several weeks but it beats chemical hair colors, which can affect your health. GROWING TIPS: Harden off before transplanting. Once established keep pinched back (which you will do naturally as you use it for teas, dishes and potpourris) to keep it from becoming leggy. INSTRUCTIONS ON RECEIPT: Open immediately and give a drink of water, preferably filtered water. If using tap water, allow the water to “breathe” overnight before using to dissipate any chlorine which can be fatal to delicate organic seedlings. Put under grow light or near a natural light source, preferably without cold or drafts for at least a few days to settle down from its journey, keeping it moist but not waterlogged. If weather is not permissible you can hold your seedling for some time, potting up as necessary after a month. (Keep in its original pot for that long if you are not moving to the garden, as a new growing medium or too large a pot could cause failure.) If weather is permissible, begin your hardening off process of very gradual exposure to outside elements – 15 minutes at a time, graduating up to a full day by 15 minute to half hour increments. Watch carefully! 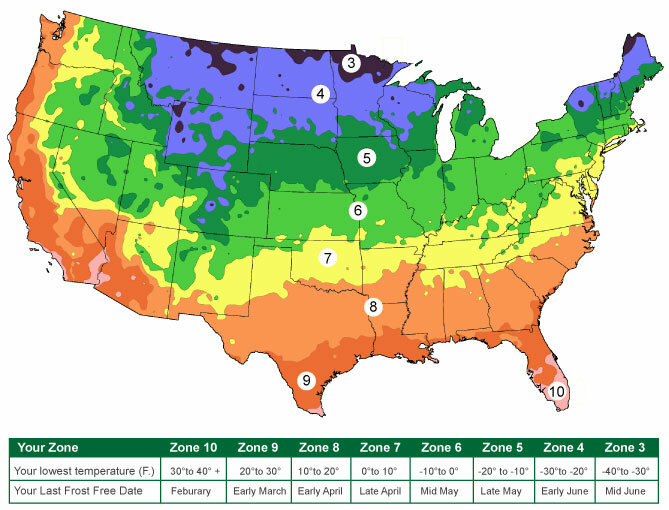 If it is warm already in your growing zone, you can quickly lose transplants by rushing this process. Patience is rewarded with a vigorous transplant. When fully hardened off, situate to their permanent garden spot and let rest a day or two there, again, watching carefully for any sign of distress. Then, when you have a nice cloudy day in the offing, transplant into the garden, providing any support or cover required, giving a shot of organic fertilizer (I recommend Espoma). Keep watered, but not waterlogged. Keep a watchful eye on your baby.